Scotland flanker Hamish Watson has signed a new two-year deal to stay at Edinburgh until May 2019. The 25-year-old has won five Scotland caps since making his debut in the 2015 RBS 6 Nations. “I’m absolutely delighted to be staying at Edinburgh, it’s a great club with a great squad, coaching team and backroom staff, and I love the city,” said back-rower Watson. “I feel that this club is right for me to continue developing my game, and a place for me to stay and build on my Scotland caps. Manchester-born Watson has made 66 senior appearances since switching to Edinburgh’s academy from Leicester Tigers in 2011, and qualifies for Scotland through his grandparents. “Hamish is an outstanding individual, who gives everything for the team every time he’s on the park,” said acting head coach Duncan Hodge. 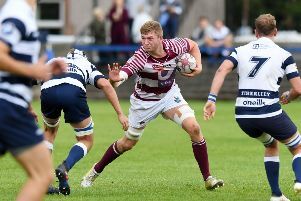 “He has worked extremely hard to develop his game over the last couple of seasons, and his efforts have paid dividends as he continues to perform and improve in an Edinburgh jersey.